900 Milers generally prefer loops. It makes traveling in one vehicle simple. But some hikes simply do not lend themselves to convenient loops. Key swaps are a good strategy for avoiding the double mileage of Yo-Yo’s and lets’ face it, a few trails are long and do not fit well into loops. Old Settlers Trail, at nearly 16 miles, is a case in point as it traverses between Cosby and Greenbriar. Even shorter saunters like Roundtop Trail and Cove Mountain Trail come with logistical challenges for the solo hiker. In remote areas like Parson Branch Road, sometimes you just have to hoof a road walk to get it done (like when I planned my road walk against the one-way traffic like an idiot…). I find two options worth consideration. First, hitchhiking. One should always consider their own comfort and personal safety in choosing this option but even then, there are ways to hedge your bets and leverage in favor of safety. 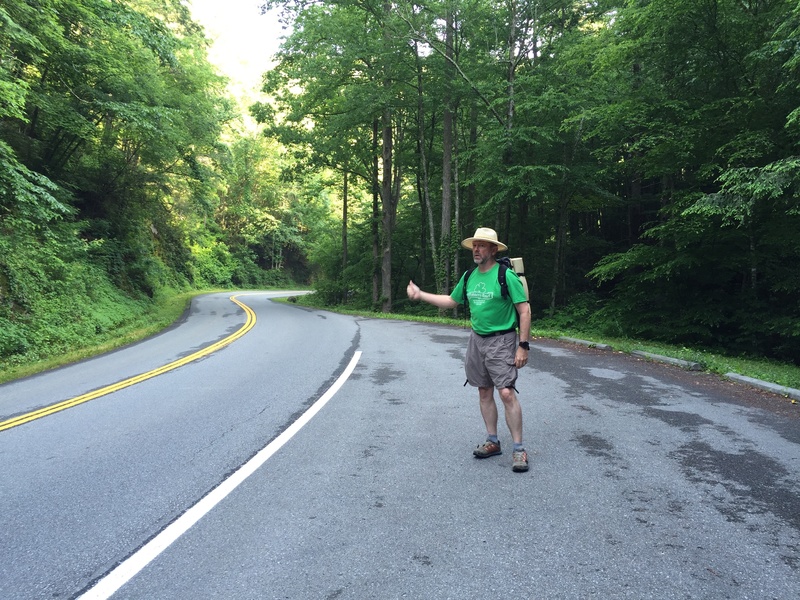 In my case, I am about 80% successful hitching rides along the main thoroughfares like Little River Road, Laurel Creek Road and Newfound Gap Road. It’s usually the fishermen who are most sympathetic. Maybe it’s because they drive pickups and they have been standing knee deep in cold water all morning. Despite the relative high numbers, I have never been offered a ride on a motorcycle. No judgement, just sayin’. Position yourself near pull-overs and overlooks. Slower traffic increases your odds and it also gives would-be angels a place to pull over for you. Your chances of getting a ride in curvy stretches with no pull outs are about as good as finding a parking spot at Ramsey Cascade Trailhead after10:00 on a Saturday. Be visible. It sometimes takes Karma a few seconds to work on some drivers. Find a good straight section of road. Smile and wave at those who pass you by. You’re an ambassador for your kind and while they may not stop for you, they may the next time if they find hikers to be friendly. Be patient. It often takes about 20 minutes for a connection to make. You may have to ride in the back of a pickup. Make sure you have gloves in February! It behooves oneself to present in a manner as to not appear like one who refers to oneself as, “one”. Look friendly and safe. Smile. No one stops for smug 900 Milers with a strong air of entitlement or for that matter, someone who looks like they have a strong air. Try to look like you smell good! Save the condescension for your Facebook post. Best Advice: If you meet up with other hikers, especially near the trailhead, mention you need a ride. Birds of a feather. This has worked twice for me in the last month. I completed a backpacking trip at the Gregory Ridge Trailhead at the turnaround on Forge Creek Road. It’s about 2.5 miles back to Cades Cove but that weekend, there were plenty of hikers on the trail. I passed a couple near the trailhead, exchanged some trail intel in a polite and gentile manor. They were happy to give me a lift back to the Cove. The second instance came with a hiking partner who finished up on a side trail while I negotiated the arduous climb and subsequent descent of Smokemont Loop trail. The car was several miles up at the trailhead at Kephart Prong Trail. She met up with a hiking group, made quick friends and not only scored a ride but a cold soda to boot. When I got to Smokemont, the car was there at the end of the trail. Uber of the Smokies! Recycle that ‘cycle. Another option I piloted successfully this past Memorial Day. I needed Chestnut Top Trail and the prospects for hitching a ride from the trailhead at Schoolhouse Gap Trail back to the “Y” were pretty good given the trail’s popularity with day hikers and tourists. But I had been itching to try a bicycle solution. So I got a heavy cable and a good lock and stashed my mountain bike a little ways up the bank at the parking area. Then I drove back to the “Y”, lashed my bike helmet to my daypack and had a glorious morning of hiking. When I arrived at the trailhead, the bike was there safely cabled to a tree. In less than 5 minutes, I was headed down Laurel Creek Road and 20 minutes later, i was on the way to the Burgermaster in Townsend. It really helps to plan for a downhill ride. Climbing up to Laurel Falls is a killer, even for seasoned lycra-clad cyclists on expensive road bikes. Bank your Mojo. Karma counts! I give a ride to a fellow hiker every chance I get. Sometimes, even when they are not hitchhiking. Chances are, if you see someone hoofing it on the side of the road with a daypack, they are headed for their car. If you help them out, he or she may see you the next time, or the next hiker. Even the fishermen appreciate being asked if they need a lift. Just remember not to blame Karma when the ride never comes. Mojo doesn’t work that way. This entry was posted in Philosopher's Guide and tagged Hitchhiking on June 1, 2016 by blogginggazelle.